As the background to an exhibition abotu the Sundan National Museum's centenary, this article provides a brief overview of Sudan's archaeological past from 200,000 years ago until 1500AD. Two French amateur archaelogists this week published a book in which they claim to have located the secret burial chamber of the Pharaoh Cheops in the Great Pyramid. On the face of this article the claim appears to be more than the usual hocum, and is based on the use of microgravimetry, which measures the density of materials, and radar technology. The theory has not been tested, due to being blocked (it is claimed by the article) by Egyptian authorities. A 30th Dynasty granite relief has been returned to Egypt by Christie's auction house in New York. The relief was one part of a larger scene which had been removed from the temple of Behbeit Al-Hegara in the Delta governorate of Gharbiya. More information at the above link. Another waterlogged 26th Dynasty tomb has been found in the Heliopolis area of Cairo, accomapnied by over 400 "small statue figures". It was discovered during the construction of a house. A fascinating article about the failure of founders and supporters of "Coptic studies" to find an agreed upon definition for Coptic studies as a discipline. It is an interesting insight into the nature of academia itself. This article summarises some of the issues that emerged form the International Association for Coptic Studies (eigth congress). The Ministry of Tourism have announced that they are planning to move 150 houses currently on the path of the avenue of ram-headed sphinxes in Luxor, and will pay residents compensation for this. This is to enable archaeological excavations, after which the avenue will be extended between the Karnak and Luxor Temples The Ministry has also said that it would bear the costs for establishing 1,000 houses at Al-Taref Village, as a primary step for moving 4,000 families living on archaeological tombs on the western bank in Luxor. Three massive and very beautiful Roman mosaics from Tell Timai (Mansoura, Delta) have been restored and put on display in Alexandria in the Graeco-Roman Museum. There is an image of one of them and a description of all three at the above page on the Al Ahram website. Article about the Egyptian problems with internal security in Egyptology. Zahi Hawass is talking int terms of tightening security, improving record keeping and launching programs aimed at convincing Egyptians that it's their job to protect their past. The article says that "When it comes to stealing Egypt's heritage, the potential payoff is so high and the chances of getting caught so low that even members of Egypt's elite are willing to risk their reputations and their liberty. " Under Egyptian law, antiquities smugglers can only be sentenced for to up to five years in prison. See the article for more information, with many quotes from Hawass. "The remains of a colossal seated statue of Ramses II, thought to be about 13 metres tall and weighing 700 tons, have been discovered in a shanty area of the Upper Egyptian city of Akhmim, adjacent to the open-air museum. The lower part of the limestone statue is seated on a throne, to the right and left of which are figures of two of the pharaoh's daughters and princess- queens, Merit-Amun and Bint-Anath" (Al Ahram Weekly). For more information see the article, which goes into more details. A predynastic tomb has been found by the Belgian Mession at Wadi Hosh, Aswan, dating to around 4000BC (6000 years old). The remains of a womean aged between 40 and 50 years old were found. I have been unable to find any other information at present. 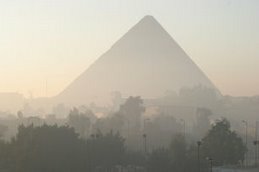 Other news items in the article include plans to introduce another robot into the Great Pyramid. Very unusually for the BBC, this is not a very well written article. However, the main content is that a researcher has published a paper about the looting of the tomb of King Sobekemsaf, during the New Kingdom era. The article says that the thieves were caught and tried in the Thebes, but that the senior officials who were found to be involved were let off and these details of the case was hushed up, while the robbers themselves were punished. For those of you with any Arabic, you may get more sense from the original article in the newspaper Al-Masri Al-Yaoum. The researcher is named in the BBC article as Ahmad Saleh. A three-month search of the Egyptian Museum's basement, has confirmed that 36 gold bracelets and two gold rings dating back to the Roman Empire have, as previous reports suggested, disappeared. Their insurance value is LE150 million. Over the next week, prosecutors will interview former SCA secretary-general Gaballa Ali Gaballa, Zahi Hawass, the current SCA secretary- general, and former directors of the Egyptian Museum. WHILE laying the foundation stone of a new mosque in the Al-Basriya area of north-east Cairo's Ain Shams district,found a 26th dynasty tomb containing the skeleton of priest Ankh- Khonsu Deirt Hur, whose name means "the creation of the god Horus" in a large basalt sarcophagus accompanied by four canopic jars. The tomb, which has suffered water damage and is in poor condition, may have to be dismantled, restored and transferred to the open-air museum in Matariya, where a collection of 26th dynasty tombs is exhibited. A mission from the University of Leuven has been excavating at this site, and has found a multi-period occupation. "The mission is primarily concerned with an area that has been largely unexcavated, and which reveals continued use over successive dynasties. Willems made particular mention of the Old Kingdom cemeteries, and of the new evidence on First Intermediate Period rock tombs, Middle Kingdom tombs and mastabas -- about which nothing serious has ever been published -- and structures in the Second Intermediate Period -- in which usurped stone from earlier structures were used." Many more details and a map are at the All Ahram site above. An unusual predynastic vase in Harrogate Museum, originally part of a private collection, which has long been thought to be a fake has been scientifically tested and found to be the real thing. The reason it was thought to be fake was because of the uncharacteristic nature of the decoration, but it has now been dated to around 5000 years old (just before the unification of Egypt under one king). A good article discussing the latest theories about the origins of agriculture. Agriculture appears to have been adopted in an entirely different way in Africa, and recent and ongoing genetic studies suggest that cattle were domesticated in Africa thousands of years before plants, in a pattern quite unlike that adopted by Europe and Asia. Egypt is the joker in the pack - it had both cattle (probably African varieties) and Near Eastern domesticates, although it adopted agriculture several hundred years after the Near East, in spite of its relatively close proximity. Quoting many scholars and their research, this article describes some of the most recent ideas. Builders laying the foundations for a mosque in northeast Cairo found a tomb dating from the Pharaonic period intact but submerged in ground water up to the ceiling of the tomb. The tomb dates to the New Kingdom and contains an unopened basalt sarcophagus, four Canopic jars, and inscriptions showing the tomb belonged to a man called Ankh Khansu Derat Hor. At Akhmim in southern Egypt, while digging foundations for a religious school, workers found remains of a temple and pieces of a giant statue of the pharaoh Ramses II.